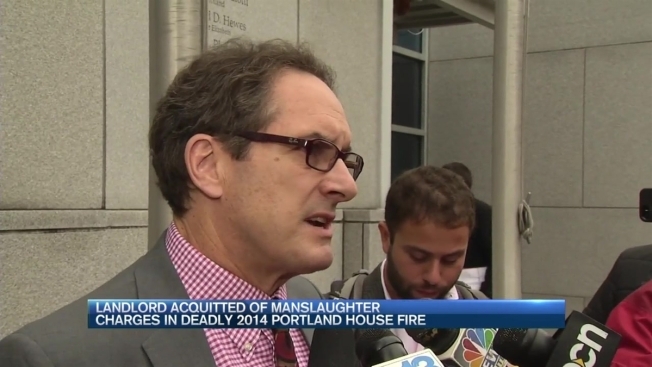 A Maine landlord has been found not guilty of manslaughter in connection with a 2014 fire that killed six people in a building he owned. If he had been convicted, Gregory Nisbet would have been the first landlord in Maine to be found guilty of manslaughter in an accidental fire. "We're disappointed, the families are disappointed," said prosecutor Bud Ellis, after the Judge Thomas Warren announced Nisbet was found not guilty of six manslaughter charges. He was found guilty of one misdemeanor fire code violation, and faces a maximum sentence of 180 days in jail and a $1,000 fine. "We knew from the beginning it was a difficult case," said Ellis. It was a difficult decision for the family members of the six victims: David Bragdon, Chris Conlee, Nicole Finlay, Maelisha Jackson, Steven Summers and Ashley Thomas. Some family members cried, others walked out of the courtroom as soon as the judge said "not guilty." All of the family members declined to be interviewed, but one left the courtroom calling the verdict "ridiculous." The accidental fire, blamed on improper disposal of smoking materials, started the morning of Nov. 1, 2014 at 20 Noyes Street in Portland, after several of the tenants returned home from a Halloween party. Prosecutors argued if landlord had made sure there were working smoke alarms and had adequate exits from the building, the tenants could have escaped and survived. "Based on the evidence, there was a reasonable possibility that they were overcome by carbon monoxide before they could have or would have attempted to exit," said Judge Warren. While Nisbet's attorney said his client was satisfied with the verdict, he was still saddened. "Nothing is going to alleviate the tragic nature of this and the pain and sorrow that Greg Nisbet is feeling," said his attorney, Matt Nichols. "That's going to be with him the rest of his life." Prosecutors said there is at least one good thing to come out of this: landlords and inspectors seem to be taking rental property safety more seriously. "The fire marshal made clear that the day after this, their phones were rMaine landlord Gregory Nisbet has been found not guilty of manslaughter in connection with a 2014 fire in an apartment house he owned that killed six people.inging off the hook," said Ellis. "Landlords were calling, they wanted inspections. Our hope is that more is done as a result of this, so this kind of tragedy doesn’t happen again." In a statement, Portland City Manager Jon Jennings said the city has taken several steps as a result of the fire: creating the Housing Safety Office, implementing rental housing registration, and increasing inspections. Nisbet's sentencing date has not yet been set. A wrongful death lawsuit is pending, brought by the families of the victims.